For our blog readers that follow Cathie's "Sincerely Vintage" column in the collector, here is her article from our July issue. I’m all a-flutter for junk. I just spent the past few hours with a bolt cutter performing surgery on a deliciously rusty set of bedsprings, preparing them to be used individually in all manner of DIY projects. At least now, the old bedsprings won’t be propped up against the side of the garage, and my house will look a tad less like a salvage yard for a few days – until I bring home the next deliciously rusty prop up in its place. Actually, it might only be a day until the slot gets filled again, since we’re heading out in the morning for my second trip in a week to Nephi, home of Picker’s Paradise - Larry Ray’s Heaven-on-earth for junkers. 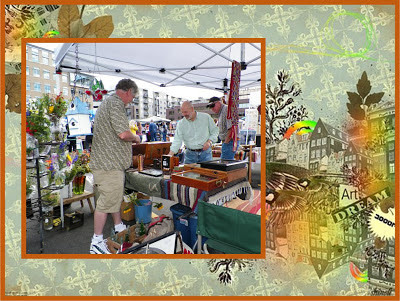 I got to know Larry a little when he was a vendor at our flea market, fleattitude last month. Larry’s the guy with the twinkle in his eye and the good stuff that everybody wants in his booth. Pedal cars, road signs, rotary telephones, traffic signals (yup, the real kind), rusty wagons and more rust – lots of rust. * Two old sewing machines, one totally rusted. Several faucet handles. A double bike basket, the kind that goes over the back fender. One wire shopping cart, the old kind. A basket full of ornate door knobs. Several glass bottles. Two Chevrolet emblems. Two feet for a cast iron tub. One rusty bucket. A couple of huge rusty hinges. A small painted wood drawer. A minnow bucket. Two rake heads, very useful for hanging jewelry. And a very old Frigidaire refrigerator. 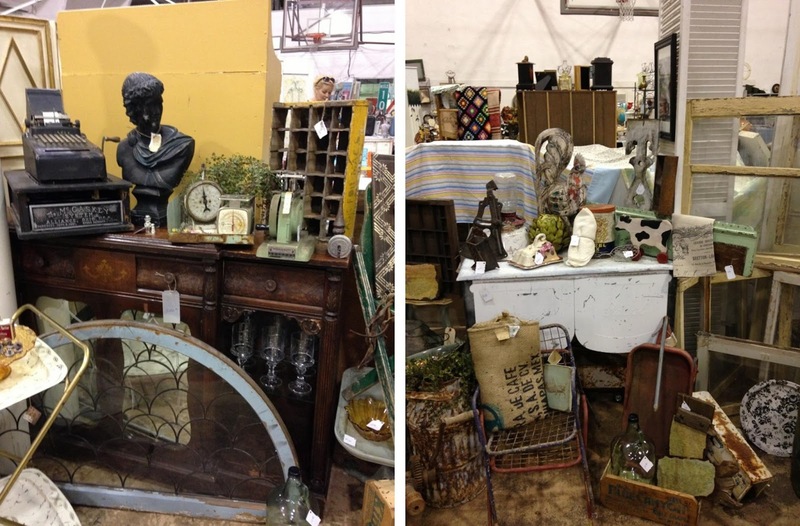 Oooh – it was a good day for junkin’.So. . . what is this newfound attraction to stuff that used to be tagged to go to the landfill? Junk seems to be popping up everywhere the past few years, and in well-respected antique circles to boot. Take, for example, Junk Bonanza, Junk Salvation and Funky Junk. . . all flea markets ranked among the best in the country (in Minnesota, Washington state and Idaho, respectively). There are books about junking. A few of my favorites are the “Junk” series by Mary Randolph Carter; Found, Free, and Flea: Creating Collections from Vintage Treasures by Tereasa Surratt; and The Salvage Sisters’ Guide to Finding Style in the Street and Inspiration in the Attic by Hackett and Young. There’s even a Facebook page and blog that represents a guy’s perspective on junking, Junk Nation Review. And this is just the tip of the iceberg. . . or, perhaps a better analogy is that this is just the junk we can see from the curb, not even touching what’s in the garage, the yard or the shed.Curious as to exactly why junk is America’s newest antiques darling,” I put out the question to some fellow junkers. Their replies were eerily similar. * “Simply said, we live in a disposable world nowadays. I love collecting and junking because it reminds me of my grandparents and simpler times. Getting something new was a real treat back in those times. I treasure my vintage finds as they spark memories of my awesome childhood". * “I think that our history and heritage is being lost in the new generation and it's so important. There are certain things that I feel like we need to keep in order for those who come after us know what it was like for those who came before us". * “My grandparents are gone and there were 90 grandchildren to share with, so I watch for things they had so I can have them too. My most treasured item from my grandpa is an old chew can. Smells like grandpa, I love it, cried when my sister found it". * “When I see a piece that resembles something we had when I was a child I want it. It is my "comfort quilt" in this crazy busy world. I miss Mayberry". There was another stream of thought in the replies I got. This one along the line of how junking is “green” and affordable, and how we can turn our junk-treasures into something “more” than what they originally were: “The creativity of people absolutely blows my mind!! Junking is a new art form and I love seeing what people do with things that would otherwise be destined for the landfills. Personally, I have always been a "Junkie, but I think the recent surge has been spawned from the recession: people are getting more creative with less, to make money, or help make ends meet. Or, just finding fun and inexpensive ways to feed their addictions, create art, etc. Right now I am making some very cool bathroom towel hangers out of cement finishing tools. . . ha – who would of thought?!". So. . . what do I think about all this? I love antiques that show their age. Love the rust, the dents, the chipping paint, the frayed edges. I love things that are not perfect. Things that have earned their place in the world by having been here for a while. I love my “new” rusty sewing machine that was likely cast off when a newer, sleeker model came along. I think I’ll hang onto it to remind me of all good things from years past. I miss Mayberry, too. ISN'T THAT ONE OF EARL MORAN'S MARILYN MONROE PIN UPS? READING THE NEW CENTURY COLLECTOR? Marilyn Monroe & famed pin up artist Earl Moran. 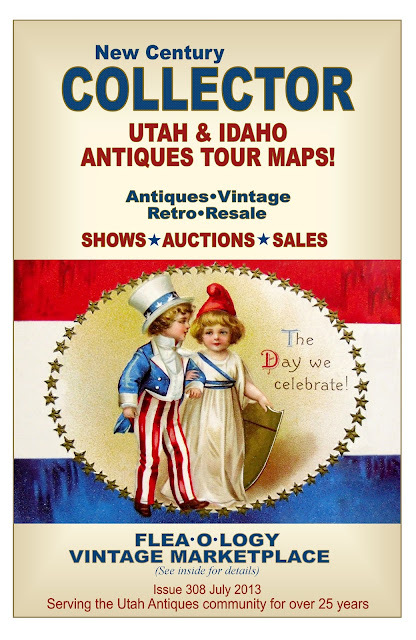 THE LATEST ISSUE OF THE NEW CENTURY COLLECTOR WILL BE IN YOUR FAVORITE ANTIQUES OR VINTAGE SHOP THIS WEEKEND! But of course, if you just can't wait, to ahead and take an early peek at the new issue right now! 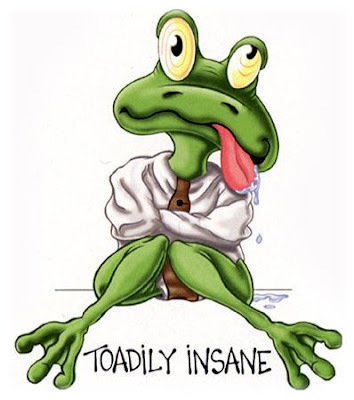 A LITTLE INSANITY GOES A LONG WAY TOWARDS HAPPINESS! I got my first taste of collecting, when my wife began dragging home a few old rusty kitchen gadgets that she had acquired at the local flea market. I was amused, but not surprised, since during the 1980's, everyone seemed to be gleefully riding along on the antiques decorating bandwagon. I was also not surprised that she had chosen kitchen collectibles to take her first collecting baby steps. The fact that she had been appointed the families chief cook and bottle washer, and was attending to the feeding of our three kids, their menagerie of friends, and a hungry husband, meant she was spending an inordinate amount of time in the kitchen. Kitchens are after all, the axis of our daily lives. It's inevitable, that when you visit family or friends, eventually you end up plopping down in the kitchen. It's no surprise then, that kitchen antiques are among the most popular collectibles. Nevertheless, be careful; collecting these shiny little decorative objects can become just a tad obsessive. Curiouser and cuiouser. The hunt for kitchen collectibles has a way of turning us into amateur sleuths and anthropologists. "Have you ever seen one of those? ", “what do you think that was for?”, "is that plastic or Bakelite?". As I moseyed along the path into the wonderland of kitchen collectibles, no one warned me to keep an eye out for the rabbit. It wasn't long before I found my life had become increasingly populated with whatzit’s and thingamajigs, with each new discovery providing more questions than answers. The search for some new gadget was occupying more & more time. If I had only known that with every new acquisition, I was edging myself closer to the rabbit hole. Before I knew it, I found myself spending every weekend at estate sales, peeking into dreary, greasy little kitchen drawers, discovering within each cubbyhole a cacophony of gadgetry as exotic as the artifacts extracted from King Tut’s tomb. It was as exciting as examining a time capsule, "Who made this thing?" "Ooh, What’s that? ", "Is it patented?, where's the number? Where's the date?". Is there hidden meaning surrounding the difference between red and green handled kitchen tools? What are these white handled doohickeys? Who's watching me? I gotta get this stuff. Where’s a box. I didn't even think about the old lady I had pushed aside trying to be first in the door. leaving, I found her still crumbled up in a pile by the porch, I lithely stepped over her; the next sale was miles away, and it's almost 9:00. I was no longer at the edge of the hole, I was having tea with Alice. I had to face it. I had become an ECKO junkie. Most of my free time was now spent franticly searching yard sales, flea markets, and antiques shops & shows in search of my next kitchen utensil fix. I had also come to recognize that the task would be far greater than I had first thought. I was living in a world containing an endless variety of vintage eggbeaters, can openers, fruit bottles and alluring chrome gadgets. I cringed. There were probably kitchen gadgets I didn't even know about. On cue, the heavens opened and the truth revealed itself; what I needed was a research library. God I love this book. 300 years of kitchen collectibles, 644 pages, the bible of kitchen wizardry. I locked myself in the bathroom for 3 days, and emerged an expert on can openers and corkscrews. My crusade was obvious. Get one of each. It's getting hard to sleep the night before an antiques show, the anticipation is brutal. It keeps my stomach churning like a lump of butterfat in a 2 quart Daisy. I might as well get up. Since I can't sleep, or get into the show before ten, so it only makes sense to hit a few yard sales on the way. This is a catastrophe. This is bull#$*%, I should have past that last sale, all I got anyway was a crappy old Becker's church key. Now here I am, stuck in the back of the line, and all the best stuff will be gone before I even get through the door. Geeez, that guy is coming out with the sweetest little pie bird you ever saw. I should have stayed in bed. Note to self; start setting your alarm for 5:00 am on Saturdays. Time passed, and I became an advanced collector. My library had expanded, and I had wisely read all of the price guides. Unfortunately, I had begun to perceive my can opener collection to be my biggest asset, and the core of my retirement plans. My IRA could now be seen sitting on shelves, and dangling from nails on the kitchen walls, giving the place a kind of surrealistic Christmas tinsel look. Kitchen gadgets now completely dominated my life. To celebrate 20 years, I gave my wife an old A&J beater for our anniversary. "Come on now, it’s a hard one to find". As she put her stuff in the moving van, all I could think about is how many shelves I could fit into her sewing room. I’ve worn the same underwear, and there hasn’t been dinner on the table for 5 days. Turns out I do miss the wife, but she'll never take me back unless I give up my collection. I begin to wonder if there's a twelve-step program for this. I was Encouraged, having found a local Antiques Anonymous chapter. However, sponsors are scarce. As you know, it’s not easy to find someone disciplined enough to give up collecting. 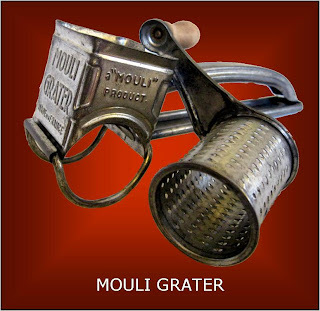 Nevertheless, I persevered, and eventually located Tom, a recovering Mouli Grater collector who was willing to be my sponsor. The next Saturday morning Tom and I found ourselves climbing over the back wall at the local swap meet to get an early peek at the goodies. Flashlight in hand, he quickly located a pair of stunning green handled slotted spoons. "Well, that doesn't surprise me; the jerk kept them both for himself". I shuffled away angrily. Antiques Anonymous is a friggin' racquet. My relationship with my sponsor was certainly over, however, later in the morning I happened upon a mint condition Fisher Beer church key, and started feeling a little better. And, as it turns out, the trip to the swap meet wasn't a total loss. While I was there, I signed up for my own permanent stall. Now I can shop early during setup every Saturday. That's how you get the good stuff you know. Life is pretty sweet now. The collection is coming along just fine, and the wife even allows me to occasionally visit the cast iron beater collection that she took with her when she left. She even asked once about a date, but when I started looking on a handle for a patient number, she just shrugged and left the room. Que Será, Será". Still, life has its moments. As a matter of fact, last Saturday at the flea market I picked up a nice 1940’s cast iron ricer for only four bucks. Suckers, these guys don’t even know what they’ve got. A couple of years ago, I wrote an article for the New Century Collector, chronicling an afternoon I spent yard sale-ing with my grand daughter Sarah Lyn. Although the primary theme of the article revolved around the idea that the antiques and collectibles business was among the "greenest" of industries, I also spent a considerable number of words concerning my amusement with my grand daughter's bewilderment over an old red rotary desk phone. "What's this grampa?" the education of this child had obviously come up a little short. Well, as it turns out, what comes around does go around, and I confess to being relieved that Sarah Lyn wasn't there to watch as her grandfather found himself equally perplexed at the Saturday morning Pleasant Grove FLEATTITUE sale, when having forgotten my camera, I found myself face to face with my wife Lyn's "smart phone". She handed it to me with the phase "you can take a picture with this". However, my apoplexy must have been apparent, as she immediately began assuring me that "you can do this". My first question left me even less confident, when "how does it work? ", was countered with "I just make phone calls with it". I hadn't fumbled with the phone very long before I decided that this was all a step or two above my pay-grade, when, out of the corner of my eye, I spotted some likely help. An amused twelve-year-old girl sitting at the booth next to us. I was direct. "Can you show me how to take a picture with this thing"? "Just press the camera icon". "Which one is that?" I could almost hear her condescending thoughts "geez.... they let this guy out of the house". However, as a strong believer in the concept of the happy accident, I persevered, and after testing an icon here and a button there, voilà, a nifty little camera aperture appeared on the screen. I gave Lyn my best conquering hero look, bashfully ask my 12-year-old guru which button to press to take the picture, and snapped off my first pic. Don't call me techno-challenged. Okay, now I was ready to roll. The idea was to take a photograph of the sign on each vendor's booth, and weave them into what would be the great FLEATTITUDE collage. I was a photographic juggernaut as I moved from vendor to vendor, snapping picture after picture, capturing every image I would ever need for the project. Now, all that stood between me and the ultimate FLEATTITUDE photo, was an hour or so with Photoshop. An hour or so later I was sitting at my desk, and eager to get started, but had just one question. Humm... how do I get these photos from the phone to the computer? Lyn just shrugged her shoulders at the inquiry. But now, as master of the phone camera, I came prepared, I instinctively knew that all I needed was one of those little cord doohickey's that hooked into the phone, and plugged into the thingamajig on the front of the computer. We found one with two likely looking ends, and hooked the thing up like a couple of kids. Are we the bomb or what? I was ready to go. After all, wasn't I now a cell phone pro. It was easy to locate the icon that would take me to stored photographs. One little click, and ...... hey..... what the hell? No pictures. None, nada, zero, zip, zilch, not a hint that I had spent the morning recording the FLEATTITUDE vintage sale in all of its glory. Whatever. Shucks, am I embarrassed? Naw. I suspect this is all part of a Chinese conspiracy to take over the world. I hear the things are made by 12-year-old girls in Beijing. Like most stories, you just have to look for the silver lining. At the Fleattitude sale, I met Debra Washburn, from "Relic Mercantile" who had a booth at the sale, and had offered to send me a couple of pics. So here it is, my complete photo record of the event. Next time, don't count on me...... get down to the sale and take a look yourself. Like many obsessed collectors, I prefer to take my Sunday morning religious services in the sunshine, snooping around a flea market for bargains. And, as it turns out, nothing feeds the soul more than the discovery of an unsuspected treasure. 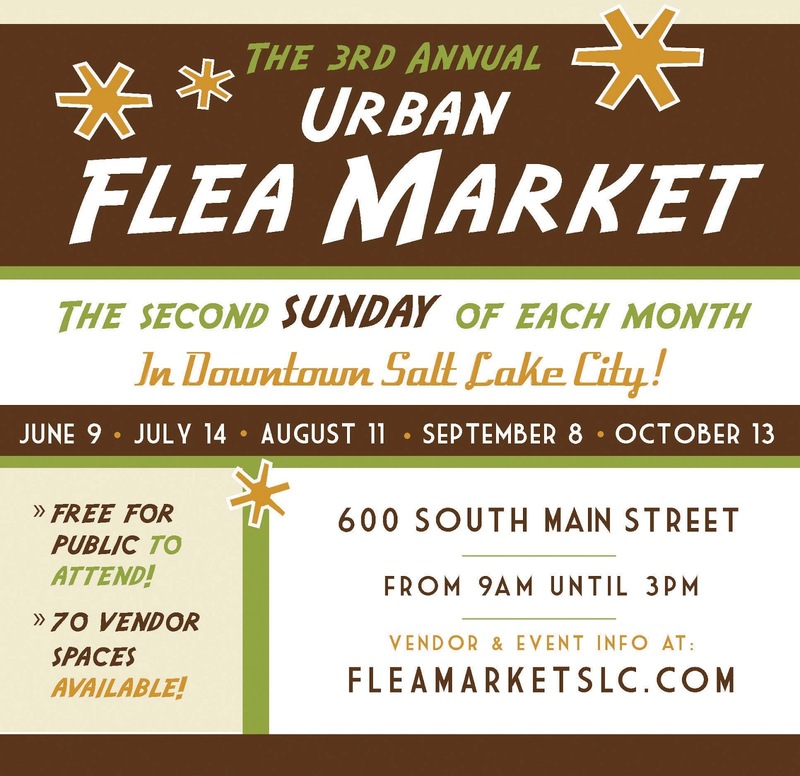 So, as you could expect, this coming Sunday I'll be in downtown Salt Lake City, partaking of services at the season opening of the SL Urban Flea Market. Here a couple of photos of the revival tents pitched at the markets 4th South location Last year. 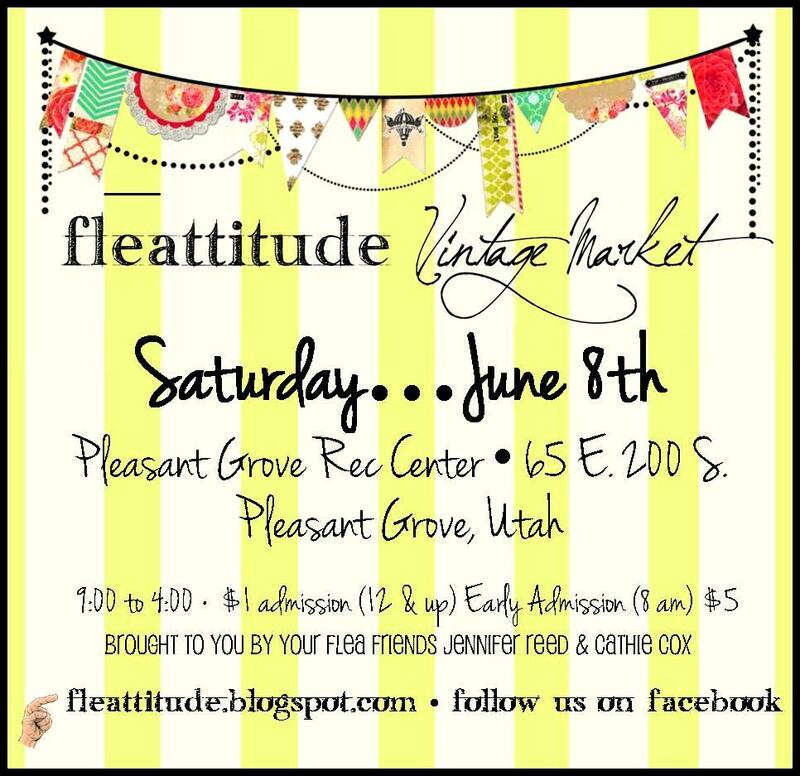 Salt Lake City, Utah (June 5, 2013) – Downtown Salt Lake City welcomes back the Urban Flea Market, Salt Lake City’s biggest downtown flea market, a great place to find and sell antiques, vintage, secondhand and locally made treasures. community outlet for vendors to sell unwanted items that will be inexpensive treasures for others. Admission for visitors is free and the event is open to the public. 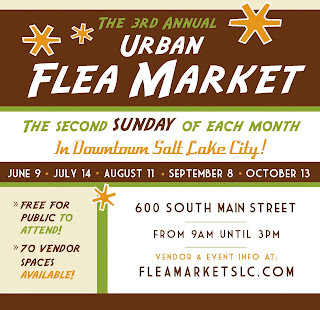 The Urban Flea Market will be held the second Sunday of every month through October 2013. Selected dates are June 9, July 14, August 11, September 8 and October 13. There will be 10’x17’ booth spaces for up to 70 vendors to rent. The event will be held from 9:00am – 3:00pm. areas, mature trees, over 100 free public parking spaces and is conveniently located near TRAX stops. 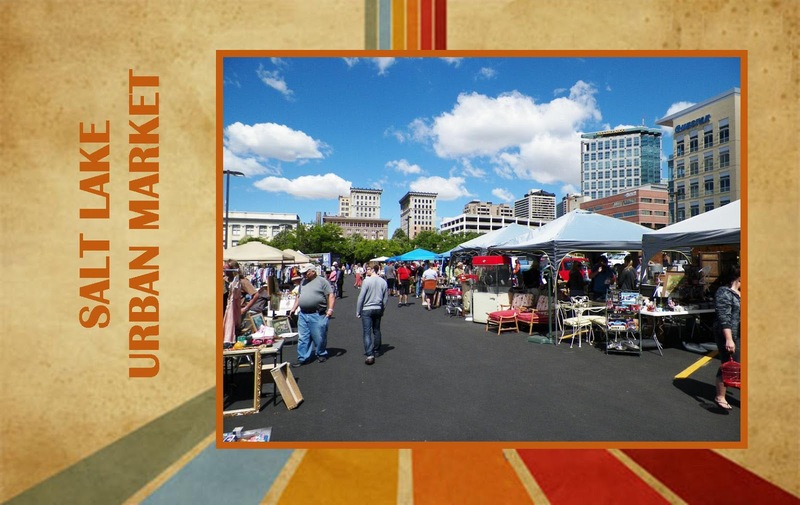 The Urban Flea Market is also happy to announce that the Downtown Farmers Market will be joining the markets this season and will provide fresh produce at select dates. This Sunday’s kick off market will feature a wide variety of vendors, music by KRCL DJ Bad Brad Wheeler, and the Utah Animal Adoption Center will be featuring animals available for adoption. Sponsors include: Salt Lake City, Downtown Farmers Market, Now & Again, Third Sun Productions, City Weekly, Edible Wasatch Magazine, Metro Display, Molding Box, Our Store, Q Salt Lake, SLC Flyer's.com, SLUG Magazine and Unhinged. 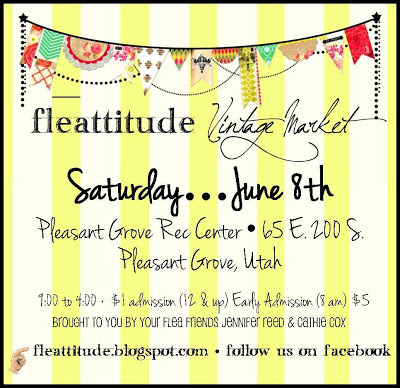 Well, unless you're implacable about grabbing a little extra shut eye on Saturday mornings, there is no reason not to jump up with the roosters and head to Pleasant Grove for a little "FLEATTITUDE" shopping. All of the hippest fleas will be scouring the old gymnasium in hopes of snagging just the right chotsky to set their heart aflutter. Mensa international fleas will of course get to the sale by 8 am, and fork over the extra couple of bucks for an early admission. See you there.